Don’t miss this event, co-sponsored by Whitworth University and Gonzaga University COML program, and the Northwest Alliance for Responsible Media! March 31 at 6 PM, Robinson Teaching Theater, Whitworth University. 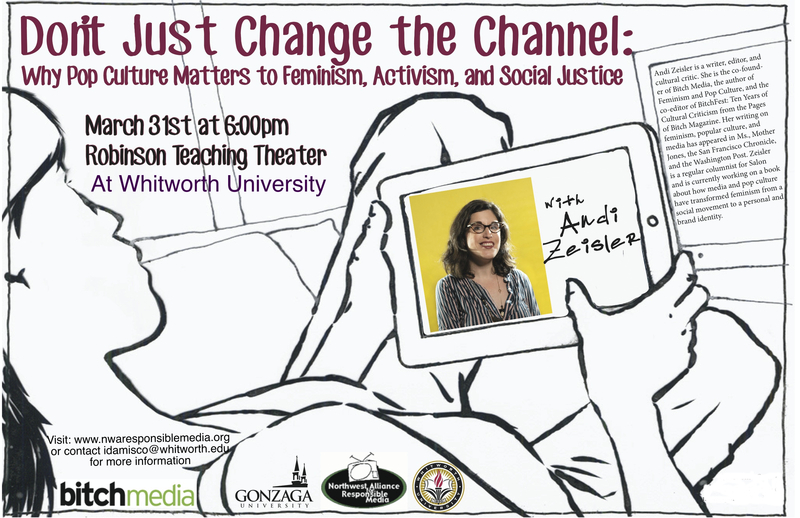 Talk: Don’t Just Change the Channel: Why Pop Culture Matters to Feminism,Activism, and Social Justice A stock response to complaints about offensive and demeaning representation of women and others in popular media is often, “Well, just change the channel! You don’t have to watch that show/read that book/see that movie.” This presentation explicates why that line of thinking ignores the reality of how media and pop culture permeate every aspect of our lives, and offers an overview of media and pop culture as a locus of feminist activism.Pop culture has long been central to feminist activism, and this presentation looks at this phenomenon with an eye to both history and the present day, noting the ways in which representation, or the lack thereof, has been a key catalyst of feminist action. From the Miss America protest of 1968 to the Saturday Night Live pushback of today, we’ll look at how foregrounding a feminist perspective in media and pop culture makes that culture better, richer, and more representative of the world in which we live. Workshop: Talking Back 101: A workshop on identifying bias, bad framing, and sexism in media and pop culture, and responding strategically. The Talking Back 101 workshop includes a presentation and slideshow on the power of media response; it includes examples of success stories in which individuals and groups have taken on harmful or offensive ad campaigns and media messages, as well as a number of tips on effective messaging. identified as activists. – from the words of Nichole Bogarosh Ph.D. Women and Gender Studies, Communication Studies, & School of Continuing Studies Whitworth University. Next, you may want to look into the most viewed videos for the week. will feel from just listening to their desired music. Thanks Brie. I look forward to catching up with you tomorrow.